Josh Bell loves a lot of things, but basketball is something he loves more than anything. He also loves poetry and writing and words. So when Josh “Filthy McNasty” finds that life is starting to get a little more complicated than your average layup, he turns to writing to figure out what is going on in his life. Josh’s twin brother Jordan “JB” starts to find he is more interested in girls than he is in practicing hoops with Josh. Their dad, Chuck “Da Man” Bell is starting to have problems with his health. And their mom, Dr. Bell (assistant school principal) is concerned about Josh making good decisions and isn’t afraid to dish out serious consequences to his actions. 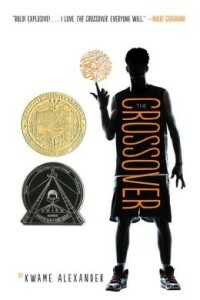 This is a good story, told in a lyrical way, about boys, life, and basketball. Josh has to learn that sometimes life is a complicated as the strategy of a basketball game. Another great thing about this book is that there is a lot of white space. The book deals with quite a few deep topics, but in a few amount of words. Which would make this a good book for those kids/teens who are interested in subject matter that appeals to their older age, but has quite a bit of white space so they don’t get scared off from the sheer amount of text (yea for good hi/low books). A great story with a memorable character who will stick around in reader’s minds for a long while. March 20, 2015 in book award winners, book review, high school, middle school, poetry, realistic fiction, young adult.